It is the earliest evidence yet of terrestrial animals on Gondwana, a land mass that included present-day Africa, South America and Australia and formed the southern part of a supercontinent called Pangaea. So far evidence of such early land life had only been found on the northern part of Pangaea —- "Laurasia," which is today North America and Asia. 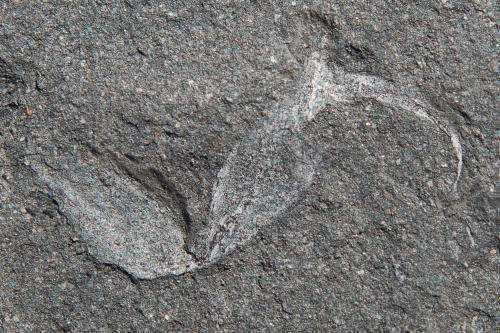 "There has been no evidence that Gondwana was inhabited by land living invertebrate animals at that time," said Robert Gess who is based at the Evolutionary Studies Institute at Wits University. Gess uncovered the scorpion fragments—with a pincer and a sting clearly showing in the rock—near Grahamstown in South Africa's Eastern Cape. By the end of the Silurian period, some 416 million years ago, predatory invertebrates such as scorpions and spiders were feeding on invertebrates such as primitive insects who were the early land colonisers. Laurasia was known to have invertebrates by the Late Silurian and during the Devonian period, when it was separated from Gondwana by the sea. 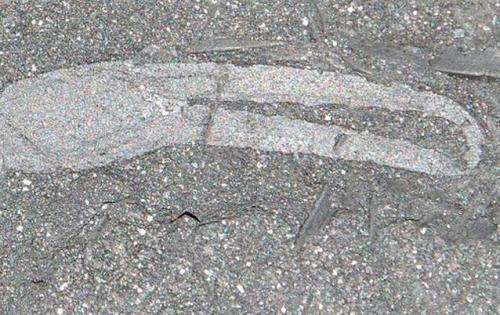 "For the first time we know for certain that not just scorpions, but whatever they were preying on were already present in the Devonian," added Gess. "We now know that by the end the Devonian period Gondwana also, like Laurasia, had a complex terrestrial ecosystem, comprising invertebrates and plants which had all the elements to sustain terrestrial vertebrate life that emerged around this time or slightly later," said Gess. The first vertebrates, from which humans eventually evolved, appeared some 350 million years ago. The findings were published in the peer-reviewed journal African Invertebrate. Scorpions are predators. The prey had to be there first. Time to examine those rocks for microfossils!